Modelled on the Kids’ Lit Quiz in which children around the world compete for first place as experts in children’s books, Book Links hosted its own quiz, the Big Lit Quiz (for Grown-Ups) it was an opportunity for organisations that contribute to children’s literature in and around Brisbane to celebrate the end of a fabulous literary year. Members from the Children’s Book Council Australia (Queensland), Society of Children’s Book Writers and Illustrators (Queensland), The May Gibbs Children’s Literature Trust, Write Links and Book Links came together to compete and were kept in control by author and quiz master extra-extraordinaire Brian Falkner. Money raised went to the Australian Children’s Laureate Program. After a delicious lunch buffet, the teams divided into groups of four and completed six rounds of questions. The winners of each round got to choose a book donated by wonderful Book Links members such as Dimity Powell and competed for various sweet during extra trivia questions rounds. It was an afternoon to indulge, connect with old friends, make new ones and determine the real experts of all things kid lit! A big thank you goes to Book Links’ Jenny Stubbs, who organised this events, the questions, AND lunch and dessert. The Curtis Coast Literary Carnivale is ‘one of the most successful and well-run festivals in Australia. It doesn’t get better than this,’ Jackie French, Gladstone Observer, 25 July, 2012. Now if Australia’s current Children’s Laureate feels that way about The Curtis Coast Literary Carnivale, then we should all find out more. Click on the Press Release below to find out the latest news, and if you want to know about the authors attending, and what they looked like as children, then you simply must click on the Author Profiles. Romancing the Stars 2014 was another unquestionably successful evening. Guests, authors and illustrators began the evening meeting and greeting each other, often with a mouthful of the delectable array of food that was handmade by Book Links Committee members. President Jenny Stubbs welcomed everyone to the event, with special mention of Gregory Rogers, who was present at the 2013 event. Josie Montano took over the reins and introduced the authors and illustrators that guests would be speed-dating. A special ‘Share the Love Launch’ was held for the authors and illustrators who have/had books coming out from January to March this year. The authors and illustrators who had books launched were Peter Carnavas x 2, Amanda Francey, Jesse Blackadder, Josie Montano, Pamela Rushby and Rosie Borella. We congratulate everyone on their recent publications, and look forward to another ‘Share the Love Launch’ at next year’s event. Guests had the opportunity to purchase some of these books from Riverbend, despite the fact that the books had not yet been officially released. Definitely a scoop for avid children’s literature fans. 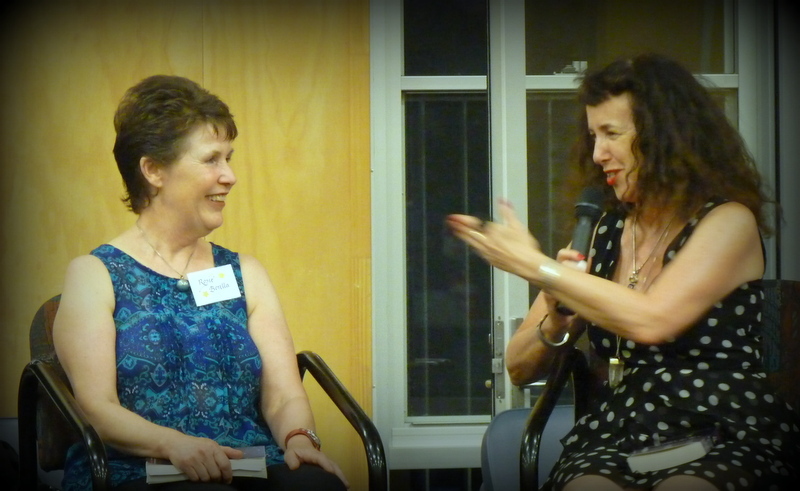 Isobelle Carmody & Rosie Borella talked to us all about their shared history in writing and journalism. It was an enlightening conversation, clearly these ladies share a wonderfully productive and creative friendship. The speed-dating began. Each author and illustrator had 3 minutes to talk about their recent works. Three minutes was clearly not enough time, our guests were itching for more, and chased up their favourite authors and illustrators when the speed-dating session was finished. The speed-dating sessions were many things, including the following. A history lesson – Pamela Rusbhy told us that the Plague in fact came to Brisbane in 1900, something she found out when researching for her latest release, “The Ratcatcher’s Daughter”. An insight into how authors get their ideas – Katherine Battersby shared that stories come from inside us, things that concern us; and how to use experiences such as your work environment to inspire stories – Rosie Borella was inspired to write “The One and Only Jack Chant” after viewing a strange occurrence on CCTV at the nursing home she works in. Taking stories beyond the page – Peter Carnavas talked to us about how two of his books have been adapted into a play and puppet show. A lesson in the publishing process – Michael Gerard Bauer talked us through how the cover for his book “The Running Man” was chosen. We even had an introduction to engineering processes thanks to Andrew King as he told us about his books “Engibear’s Dream” and “Engibear’s Bridge”. A number of the authors and illustrators donated book as prizes for the quiz that was held after the speed-dating session. It was a hotly contested quiz, with guests having to remember details from the speed-dating session. More than one winner leapt from their chairs to give the correct answer in the hope of winning a book. It was a wonderful evening, and we look forward to making it bigger and better in 2015. Join us for an informal hour of conversation, where the acclaimed author, illustrator and designer will reveal insights in to his 20 years of working in children’s publishing. The discussion will focus on his children’s picture books, the publishing process and how he develops an idea for a book and approach to illustrating. 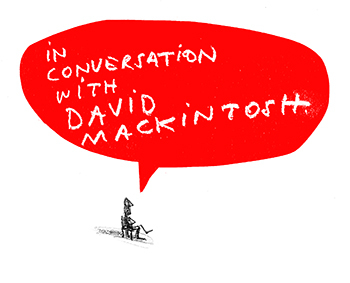 David will also discuss his role as a book designer working with illustrators such as Lauren Child, in the production and development of their books. This presentation is aimed at anyone interested in publishing a picture book, artists interested in visual narrative and the book form. There will also be time for questions from the audience and some of his picture books will be on sale. David will be in discussion with Robyn Sheahan-Bright, who published his first book. A selection of David’s books will be available for sale at the event. The night of nights for children’s literature has arrived. Romancing the Stars is only hours away. We are pleased to announce that a number of the authors and illustrators will be available for book signings from 3:30pm this afternoon at Bulimba State School. Check out the list below to see when your favourite authors and illustrators will be there, we look forward to seeing you all soon. February 14 is International Book Giving Day! “It is a day dedicated to getting new, used and borrowed books in the hands of as many children as possible”. 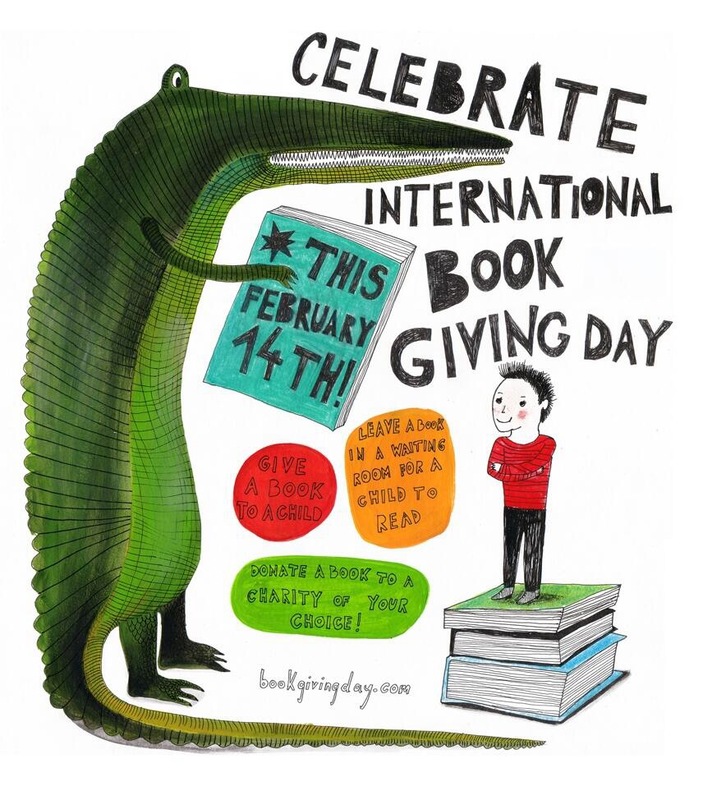 There are three ways to celebrate International Book Giving Day. We strongly encourage people getting books into the hands of youngsters. Let us know how you celebrate International Book Giving Day by commenting on this post. If you are organising any International Book Giving Day Events, please let us know and we will be happy to publicise your event. The Society of Children’s Book Writers and Illustrators held the Inaugural “Inside Story Event” on November 2, 2013. The event was held in 12 cities worldwide including Brisbane, Sydney and Melbourne here in Australia. The event had two purposes; to provide an opportunity for young readers, teachers, librarians and children’s book lovers to become acquainted with new releases and the ‘Inside Story’ behind each book; and to build traffic and sales for independent bookshops. 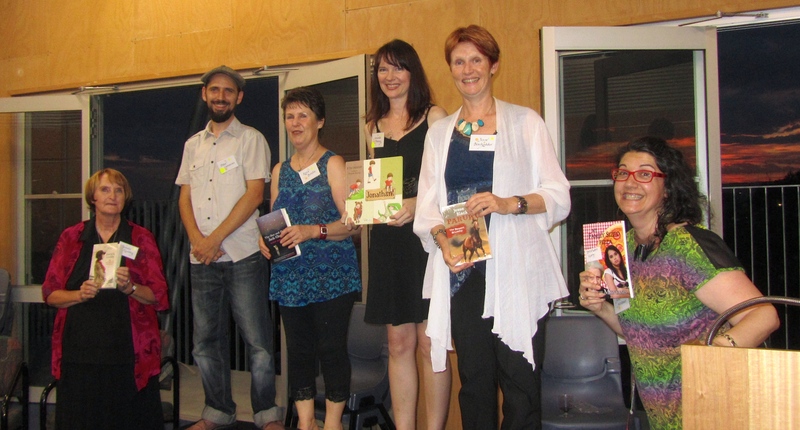 Black Cat Books and Café in Paddington – avid supporters of local authors, illustrators and children’s literature – hosted fourteen of QLD and Northern NSW’s children’s authors and illustrators. The event was skilfully organised by Angela Sunde with the help of Pamela Rushby. Angela was also the MC and kept the authors, illustrators and audience on their toes. Each author and/or illustrator was given 3 minutes to share the ‘inside story’ behind their latest release. There were also prizes, opportunities to speak with the authors and illustrators, and the creamiest cake that has even been seen. Angela is the author of Pond Magic, published by Penguin Australia. Pond Magic is a light-hearted fantasy about a 12 year old girl. Her name is Lily Pad and she can’t stop burping. She is concerned she is turning into a frog, and really is, but you must read the book to find out more. The publishing ‘Inside Story’ is that Angela was at a picture book workshop and a chair fell on her head. Due to this, the presenter gave her a one-on-one where Angela pitched the idea for Pond Magic. The workshop presenter loved it and contacted Penguin to say that the book just had to be published. Stephen is the author and illustrator of The Nelly Gang, a historical graphic novel. He won the Aurealis Award in 2005. The ‘Inside Story’ behind The Nelly Gang is that Stephen has a passion for Australian History and he has had comic strips published in the School Magazine for 30 years. Katherine Battersby is the critically acclaimed author and illustrator of Squish Rabbit which was nominated for the 2012 Crichton Award, was a CBCA Notable Book in Australia and was named a CBC Children’s Choice Award in the USA. Katherine has a boundless passion for rabbits, but explained that due to QLD Law, she can not own one unless she gets a magician’s license, which is something that she has considered. Katherine gave us 3 secret as the ‘inside story’ behind the Squish books. Secret 1 – the idea. Squish sleeps in a stripey sock because Katherine is obsessed with stripey socks. She even writes in stripey socks. Secret 2 – Brave Squish Rabbit is not too brave. Katherine is actually afraid of chickens as they have sharp beaks and beady eyes that watch you. She explained that her neighbours chickens watch her as they write. Secret 3 – the cover of the book. Part of it glows in the dark. The fireflies on the back, the stars on the back. Judy has an early childhood background with fine arts. She won 3rd place in the CYA Picture Book Competition in 2010 and 2nd in 2011. She is the author illustrator of Baby Tawnies. The ‘Inside Story’ behind the book is that she was inspired by a family of tawny frogmouths sitting outside her house during the winter. One season she watched a pair of baby tawnies grow. As she feels she can not draw, she made the Tawnies out if felt. She then photographed the felt tawnies. Judy got published by getting a contract with Random House at the CYA Conference in 2011. The ‘Inside Story’ behind The Pink Pirate is that it was written for her niece as Michelle believed that there are not enough books written where the girl is the hero. The Dad is based on her brother, who does have a ginger beard. The bad guy based on brother’s best friend who is a drummer in a heavy metal band. Jennifer Poulter is an award winning, internationally published author and poet. Her latest picture book Toofs is about a wolf family. In Toofs, the baby wolf bites all the other family members! The book incorporates strategies for helping families with biting kids. The ‘Inside Story’ behind Toofs is that Jennifer’s daughter is a child care worker. She told stories about kids biting other kids. They decided to do a book based on the stories with strategies for families to get through the issue. Christine is the acclaimed author of Dust and Henry Hoey Hobson which was shortlisted for numerous awards including CBCA Book of the Year for Younger Readers. Drongoes is her latest offering. The ‘Inside Story’ behind Drongoes is that Christine once said to a you’re a dill.” The child asked, “what’s a dill?” “Like a drongo”, was Christine’s reply. The child didn’t know what a drongo was either. This inspired Christine to write a book about the language of the bush which she finds fascinating. In the 1920’s a horse was named Drongo after the very active bird. In 37 races, he never actually won. His name became synonymous with someone who tries and tries but is never going to get there. A book about trying to win against the odds and Aussie mateship. Julie is the author of the Pippa’s Perfect Series in Penguin’s Aussie Nibbles Series. In book 3, Pippa’s Perfect Picnic, Julie wanted to bring in new friends of Pippa’s, but the publishers wanted friends from the first 2 books. The Publisher wanted a pony as lots of little girls like ponies. The story changed as different elements were added and subtracted based on the publisher’s requests. Finally the surprise element came and the story was published, but we didn’t get to hear about it, we need to read the book. Samantha Wheeler is the author of Smooch and Rose, a book about a koala and a very brave girl that stands up for what she believes in. Sam loves sharing stories about how to protect koala. Sam got her idea from wanting to expose something that she and others didn’t know about. She used to drop off her daughter to school and spot a koala in the paddock. One day they turned up and the paddock was cleared of trees, no koala. So the story came to be about a girl who had to do something about it. Sam grew up on a farm. She always drove past a strawberry farm. Sam found a story about a 7 year old who raised $20000 to help koalas. This inspired her to write the character of Rose. The animals in the book are based on animals that her family had owned such as the horse and dog. Dimity has won many awards for her short stories. Her debut novel PS Who Stole Santa’s Mail? is a junior novel for children. The story started life as a study assignment, inspired by a newspaper article about taking away the post box for Santa on the Gold Coast. Dimity asked “what if?” as authors always do. Dimity is obsessed with Christmas. Believing in magic and wanting something so much, and then getting it against all odds is the best thing possible. Candice writes for both children and adults. She has published three books for children and her latest release, Silver the Silly Sorcerer, was published in New Frontier’s Little Rocket Series. Candice explained, as part of the ‘Inside Story’ behind Silver the Silly Sorcerer that she starts every story with a Person, a Place and a Problem. For Silver the Silly Sorcerer it was “Silver the Sorcerer was stuck in Muddy Muck’. Candice loves magic, and the story was inspired by a bad circus experience and a fire trick gone wrong in Nepal. Pamela is a Winner of the Ethel Turner Prize, 2 CBCA Notable books and a QLD Literary Award. She writes historical fiction from female a perspective. Flora’s War was inspired by a picture of a hospital on a merry go round in Egypt as there was not enough room for all the wounded. Flora’s War is based on all the wounded soldiers coming into Cairo, and the experience of a young nurse. Pamela discovered that there were hospital wards in a local theme park. There was a ward in ghost house and a surgery in the ticket area. Flora is 16, she wears latest fashion, dances modern dances and can even drive. She volunteers to drive an ambulance, gets engaged and something happens, but as like all authors like to say, we’ll have to read the book to find out what happens next. Peter is an author & calligrapher. In 1988 one if his pieces was given to the Queen. The ‘Inside Story’ behind Calligraphy for Greeting Cards and Scrap Booking began with a visit to the UK. His aunt in England was 90 in 2010. Peter stayed on and went to a book fair. This was held at the time of the Volcanic Ash debacle. Many people didn’t make it to the book fair. Many publishers had lots of free time to speak to authors. Peter talked with publishers about the competition for Practical Calligraphy, another one of his books. He spoke with Master Craftsman Publishers who were very interested in a book about calligraphy for greeting cards and scrapbooking. They wanted 30 000 words and more than 300 illustrations. The book was released in 2013. The morning was finished off with the handing out of a large number of raffle prizes, all generously donated by the authors and illustrators. The cutting of the inaugural “Inside Story” cake was a highlight, and left many people licking the cream off their fingers for a while afterwards. Congratulations to all the QLD Branch of SCBWI on a brilliant event. We look forward to many more.